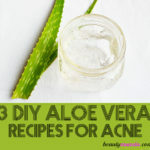 3 DIY Aloe Vera Gel Recipes for Skin - beautymunsta - free natural beauty hacks and more! 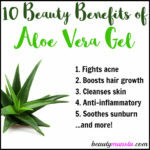 Beautiful skin lovers, you need to know about the incredible benefits of aloe vera gel. 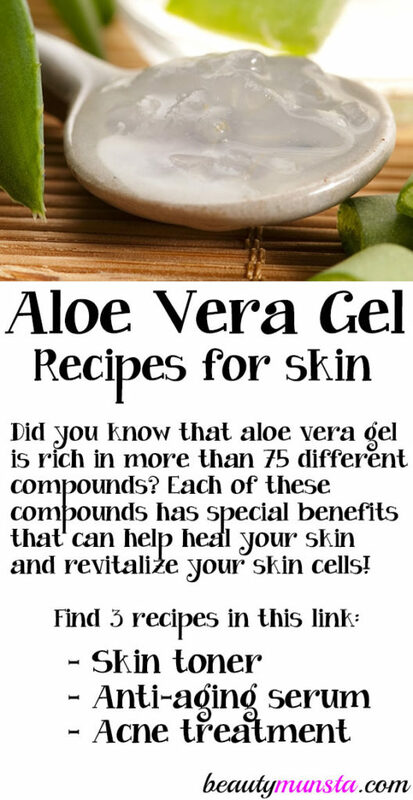 Take note of some of the best aloe vera gel recipes to take your skin care to a whole new (natural) level! Aloe vera is a succulent plant that has many medicinal uses. 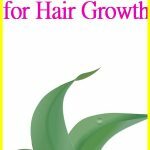 It is revered for the natural translucent and cooling gel-like substance that is found within its leaves. The benefits of aloe vera have been documented in many ancient texts around the world, including ancient Chinese, Indian and even Mesopotamian days. 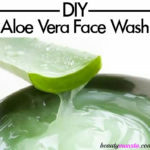 Why is Aloe Vera Good for Skin? Did you know that aloe vera gel is rich in more than 75 different compounds? Each of these compounds has special benefits that can help heal your skin and revitalize your skin cells! Some of the constituents of aloe vera gel include vitamins A, B12, C, E; polysaccharides, salicylic acid, lignons, saponins and more! Ever heard of toners? They are an important part of skin care that most people seem to skip over. Toners act as astringents that help tighten your pores, cleanse your skin and smoothen it for a flawless base that you can apply other skin care products on. 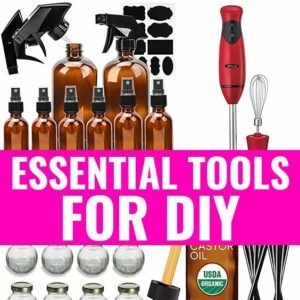 Add all the ingredients into an 8 oz spray bottle. Place the cap on tightly and shake vigorously to get all the contents well-mixed. To use, pour some of the toner into a circular cotton pad or cotton ball. Apply the toner all over your clean face. What is a facial serum? A serum is any skin product that has a gel-like consistency but a higher concentration of active ingredients that penetrate your skin. A serum acts like a high-performance skin treatment and it is often preferred by those with mature skin. But it is never too early to use skin serums! If you are in your 20’s, you can start using serums to delay any signs of aging and to maintain your youthful skin well into your 50’s! In a small glass container, mix in all the ingredients using the back of a spoon. You should get a thick lotion-like consistency. 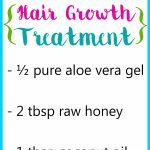 Apply just a small pea sized amount of this serum all over your face and all the way down your neck. Do this every night as part of your nightly skin treatment. Acne and pimples can play with your confidence and make you feel self-conscious. The good thing about acne is most people grow out it, right? Unfortunately, more and more people are starting to experience adult acne, in what seems to be a never-ending skin-care nightmare. This aloe vera gel for acne is a potent spot treatment that can help reduce acne overnight. Mix all the above ingredients thoroughly and store in a small glass jar. Use a q-tip to apply this aloe spot treatment onto acne, pimples, and acne scars. You can keep applying this gel up to 6 times a day to get rid of spots really fast.